"Atomic build-up" redirects here. For the spread of nuclear weapons, see Nuclear proliferation. Aufbau is a German noun that means construction or "building-up". The aufbau principle is sometimes called the building-up principle or the aufbau rule. The details of this "building-up" tendency are described mathematically by atomic orbital functions. Electron behavior is elaborated by other principles of atomic physics, such as Hund's rule and the Pauli exclusion principle. Hund's rule asserts that if multiple orbitals of the same energy are available, electrons will occupy different orbitals singly before any are occupied doubly. If double occupation does occur, the Pauli exclusion principle requires that electrons which occupy the same orbital must have different spins (+1/2 and −1/2). value. The direction of the red arrow indicates the order of state filling. In neutral atoms, the order in which subshells are filled is given by the n + ℓ rule, also known as the Madelung rule (after Erwin Madelung), or the Janet rule or the Klechkowsky rule (after Charles Janet or Vsevolod Klechkovsky in some, mostly French and Russian-speaking, countries), or the diagonal rule. Orbitals with a lower n + ℓ value are filled before those with higher n + ℓ values. In this context, n represents the principal quantum number and ℓ the azimuthal quantum number; the values ℓ = 0, 1, 2, 3 correspond to the s, p, d, and f labels, respectively. The subshell ordering by this rule is 1s, 2s, 2p, 3s, 3p, 4s, 3d, 4p, 5s, 4d, 5p, 6s, 4f, 5d, 6p, 7s, 5f, 6d, 7p, 8s, ... For example titanium (Z = 22) has the ground-state configuration 1s2 2s2 2p6 3s2 3p6 4s2 3d2  Other authors write the orbitals always in order of increasing n, such as Ti (Z = 22) 1s2 2s2 2p6 3s2 3p6 3d2 4s2. This can be called "leaving order", since if the atom is ionized, electrons leave in the order 4s, 3d, 3p, 3s, etc. The two notations are equivalent since only the orbital occupancies have physical significance. The Madelung energy ordering rule applies only to neutral atoms in their ground state. There are 10 elements among the transition metals and 9 elements among the lanthanides and actinides for which the Madelung rule predicts an electron configuration that differs from that determined experimentally by one electron orbit (in the case of palladium and thorium by two electron orbits). 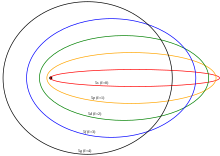 Example copper 29Cu: According to the Madelung rule, the 4s orbital (n + ℓ = 4 + 0 = 4) is occupied before the 3d orbital (n + ℓ = 3 + 2 = 5). The rule then predicts the electron configuration 1s22s22p63s2 3p63d94s2, abbreviated [Ar]3d94s2 where [Ar] denotes the configuration of the preceding noble gas argon. However the measured electron configuration of the copper atom is [Ar]3d104s1. By filling the 3d orbital, copper can be in a lower energy state. Example uranium 92U: According to the Madelung rule, the 5f orbital (n + ℓ = 5 + 3 = 8) is occupied before the 6d orbital (n + ℓ = 6 + 2 = 8). The rule then predicts the electron configuration [Rn]5f47s2 where [Rn] denotes the configuration of the preceding noble gas radon. However the measured electron configuration of the uranium atom is [Rn]5f36d17s2. A special exception is lawrencium 103Lr, where the 6d electron predicted by the Madelung rule is replaced by a 7p electron: the rule predicts [Rn]5f146d17s2, but the measured configuration is [Rn]5f147s27p1. In the old quantum theory, orbits with low angular momentum (s- and p-orbitals) get closer to the nucleus. ^ Cottingham, W. N.; Greenwood, D. A. (1986). "Chapter 5: Ground state properties of nuclei: the shell model". An introduction to nuclear physics. Cambridge University Press. ISBN 0-521-31960-9. ^ Miessler, Gary L.; Tarr, Donald A. (1998). Inorganic Chemistry (2nd ed.). Prentice Hall. p. 38. ISBN 0-13-841891-8. ^ Jolly, William L. (1984). Modern Inorganic Chemistry (1st ed.). McGraw-Hill. p. 11. ISBN 0-07-032760-2. ^ Weinhold, Frank; Landis, Clark R. (2005). Valency and bonding: A Natural Bond Orbital Donor-Acceptor Perspective. Cambridge: Cambridge University Press. pp. 715–716. ISBN 0-521-83128-8. ^ Scerri, Eric R. (1998). "How Good is the Quantum Mechanical Explanation of the Periodic System?" (PDF). J. Chem. Educ. 75 (11): 1384–85. Bibcode:1998JChEd..75.1384S. doi:10.1021/ed075p1384. ^ Goudsmit, S. A.; Richards, Paul I. (1964). "The Order of Electron Shells in Ionized Atoms" (PDF). Proc. Natl. Acad. Sci. 51 (4): 664–671 (with correction on p&nbsp, 906). Bibcode:1964PNAS...51..664G. doi:10.1073/pnas.51.4.664. PMC 300183. ^ Wong, D. Pan (1979). "Theoretical justification of Madelung's rule". J. Chem. Educ. 56 (11): 714–718. Bibcode:1979JChEd..56..714W. doi:10.1021/ed056p714. ^ Scerri, Eric (7 November 2013). "The Trouble With the Aufbau Principle". Education in Chemistry. Vol. 50 no. 6. Royal Society of Chemistry. pp. 24–26.